If your dog had disappeared for five months, you’d just assume that your beloved family pet was gone. Well, you don’t always have to give up hope, as the story of Sophie Tucker reveals. 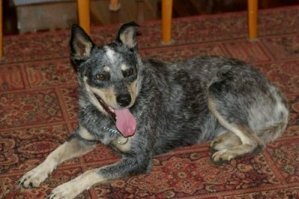 Sophie Tucker, an Australian cattle dog, fell overboard in November as choppy waters off of the coast of Queensland, Australia, and owners Jan Griffith and family had all but given up hope. Five months later, Sophie is back with her family safe and sound! Her tale (tail) of survival is incredible! Well, for starters, Sophie swam five miles (the first part of the doggy triathlon) to the relative safety of St. Bees Island. While on the island, she survived off of a diet of feral goats. Not too shabby for a household pet! And the most remarkable thing of all, once rangers found Sophie, the Griffith family contacted them to check and see if it was, indeed, their loyal friend. The whole story is simply amazing.